We’d love your help. Let us know what’s wrong with this preview of The Class by Boni Ashburn. Alarm clocks go off and students all over town wake up and get ready for their big day. Some feel eager, others are nervous, and a few are even grumpy! But they all get dressed, eat breakfast, pack backpacks, and make their way to school, where they wi Count along with twenty young students from nineteen different homes as they get ready for their first day of kindergarten. To ask other readers questions about The Class, please sign up. Delightful! A perfect book for new preschool or kindergartners. What a terrific back to school book for young kids! Loved it! A group of twenty children prepare for their first day of Kindergarten in this witty and charming picture book. The book starts with the different ways the children wake up from those who are up early to the grumpy ones to those who want to sleep and sleep. Next comes putting on clothes, then brushing and combing hair, and putting on shoes. Breakfast is next with pancakes or cereal or juice. Backpacks are put on, children catch the bus, are driven to school or walk. Emotions run high. And then f A group of twenty children prepare for their first day of Kindergarten in this witty and charming picture book. The book starts with the different ways the children wake up from those who are up early to the grumpy ones to those who want to sleep and sleep. Next comes putting on clothes, then brushing and combing hair, and putting on shoes. Breakfast is next with pancakes or cereal or juice. Backpacks are put on, children catch the bus, are driven to school or walk. Emotions run high. And then finally, all twenty are at school and ready to begin! Ashburn beautifully combines the normal day routines of children filled with teeth brushing, bathroom and breakfast with the unique things about the first day of Kindergarten like backpacks and having to be ready at a certain time. She also intertwines the emotions of the day with some children unable to sleep, others grumpy throughout, and some tearing up on the way to school. This is a way to show all of the different reactions to school but to also assure children that they are more alike than they may think. The illustrations by Gee are gentle and cheerful. They capture each child and fill the page with diversity. She is also great at showing the mixed emotions of the day and the variety of reactions that children have. The use of lots of white space allows children to see themselves on the page, talk about what they will have for breakfast, about their nerves and more. Kids around town are getting ready to start a new school year. They are all different - some move fast, some move slow, some are up early, some oversleep - but they are ready to join together to be a class. coworker really liked this book because of how it sets up differences so matter of factly, and I do think that's important to convey to kids. Nice diversity in the illustrations, although it would've been nice for one to be in a wheelchair or have a cast or something. I do think all the kids l Kids around town are getting ready to start a new school year. They are all different - some move fast, some move slow, some are up early, some oversleep - but they are ready to join together to be a class. coworker really liked this book because of how it sets up differences so matter of factly, and I do think that's important to convey to kids. At this time of year there is always a demand for "back to school" stories. Teachers everywhere all have a favorite that they like to read to their students on that first day of class. Most of them feature what goes on in school and all the mishaps of being unable to find your locker (or cubby), being worried about what the teacher will be like, missing the bus, etc. But Ashburn has put together a different kind of story. All the kids who will come together and form a class as they get out of be At this time of year there is always a demand for "back to school" stories. Teachers everywhere all have a favorite that they like to read to their students on that first day of class. Most of them feature what goes on in school and all the mishaps of being unable to find your locker (or cubby), being worried about what the teacher will be like, missing the bus, etc. But Ashburn has put together a different kind of story. All the kids who will come together and form a class as they get out of bed and prepare for their first morning of school. Some are sleepy, or worried, or have bed head. Others are excited, dressed to the hilt, or busy with putting on new shoes. But however their morning begins, they all arrive at school to form a class. It's refreshing that the time before school is shown - the search for socks, gobbling down breakfast, loading up backpacks - these are all things that kids know about firsthand. And such a variety of skin tones, hair colors, and visible levels of prosperity are shown that there should be someone for each student in a class to identify with in some way. The diversity isn't trumpeted from the rooftops, but the mention of kids who have the "Old-Shoe Blues" and of one who has to make do (because they have no backpack), shows a range of economic groups. The illustrations show children from all types of ethnic and racial backgrounds. But the main point is in the title, The Class. All these unique little humans create something amazing together, a community that will last all year and have many learning adventures. That's what school is all about. I really love this book! and it will defiantly be in my classroom and on my shelf, if you can read this to a room full of children and get a lot of grins and giggles then I feel sorry for your reading skills because I do not think anyone with a voice could mess this story up. I will not ruin this one for anyone wanting to read it but just know that every kid in every class will see themselves and there classmates in this story, and I truly believe that not one would dislike this book or not want I really love this book! and it will defiantly be in my classroom and on my shelf, if you can read this to a room full of children and get a lot of grins and giggles then I feel sorry for your reading skills because I do not think anyone with a voice could mess this story up. Have fun counting the kids on each page and see how these 20 children, with their similarities and differences, all come together to make one class. Find out who gets up before dawn and who is sleeping late, who packs a lunch, who rides the bus, who walks to school, who wears new shoes, who is nervous, and who is not. Count them all. Great story to start a graphing activity in class too. Nineteen different children are, yes, different. This story shows them getting ready for their first day in varied ways. Their dress, breakfast, feelings and the ways to get to school all are shown by the individual or the small group, but delightfully celebrating that each differs, and the wonder of it, too. It’s a terrific first day of school book. Twenty children from twenty homes all starting kindergarten. Some are nervous, others get kisses, some are alike, and all are part of one class in the end. This is a great story about getting ready for the first day of school and has a lot of opportunities to count items in the story. One of the best back-to-school books this season. Connects students across many different backgrounds, morning rituals, and families. Wonderfully diverse in many ways and encapsulates the variety of routines, emotions, and ways of getting ready to go to school. This book is perfect for kids that are getting ready to start school. My daughter enjoyed this book. Would recommend. Great back-to-school picture book that nods to its characters' diverse backgrounds and economic situations without being overwhelming for its intended audience! Cute and fun! Follow 20 children on their journey to their first day of school-what did they wear? What did they eat? Did they get new shoes? Did they get new backpacks? Are they looking forward to a new school year? Read to find out! I love this book- I think it really goes to show just how different and individual everyone is! I could see myself starting my first day of class with this book; I think it would be cool to have students relate to the kids in the book-which did you act like this morning? Maybe a 3.5; I really liked all the differences and showing the individuality of all the students. Also, has the benefit of showing morning routines. However, the way the story is written I had no idea that there were 20 children until I read it on the book flap and I don't see anyway to follow one child much less 20 (without a headache) when it seems some are pictured twice in some parts of the story. A great read aloud for the first day of school. Each child in class will probably recognize at least one of the things that the students in the book go through to get ready for school. It will make a great discussion ... finding things in common with other classmates, etc. Cute book about the first day of class and all the various and different kids, some eat the same thing for breakfast, some have new and some use old, some and fast, some are slow but they all come to class. Celebrating in a fun way all the ways we are alike and different as we head off to the first day of school! Fun rhyming read aloud for the first week of school. A fun rhythmic, rhyming text that also has kids counting like... "Five begin to look alive. This one's sure he won't survive. One is tickled. Two look worried. One woke late and now she's hurried!" Very cute. Leaves out some possibilities, but ah well. This would be a fun companion book to SCHOOL'S FIRST DAY OF SCHOOL for a back to school storytime. A lively first-day-at-school counting book that captures a variety of humorous morning routines. An entertaining picture book that will help ease any first day jitters. Love this sweet book about going back to school and all the scenarios that happen. This is one of my favorite recent picture books. August heralds a myriad of emotions, as unique and individual as students beginning their journey into the land of the 3 R’s. 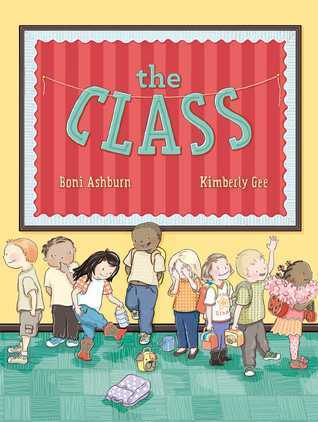 A group of 20 children is the focus of this adventure in “The Class” a picture book by Boni Ashburn that celebrates the start of school. The end pages set the stage with clever, colorful illustrations by Kimberly Gee depicting items the kids will encounter as they get “ready-set-go.” There are teddies to leave behind, socks to locate, teeth to brush, a smiley-faced pancake August heralds a myriad of emotions, as unique and individual as students beginning their journey into the land of the 3 R’s. A group of 20 children is the focus of this adventure in “The Class” a picture book by Boni Ashburn that celebrates the start of school. The end pages set the stage with clever, colorful illustrations by Kimberly Gee depicting items the kids will encounter as they get “ready-set-go.” There are teddies to leave behind, socks to locate, teeth to brush, a smiley-faced pancake to ingest, new shoes to unwrap and a rude alarm clock to quiet. From rising to getting dressed, to breakfast, to out-the-door to school’s arrival, the children’s every move is chronicled in clever rhyme, accompanied by catchy, cartoon-like illustrations that show the kids’ full range of emotion. “Eight to the bus stop after kisses. Two run fast—have near bus-misses! Colorful spreads show the cute kiddos in action outdoors and in. Repeated numbers offer counting opportunities, as well as the opportunity to follow a particular child’s progress from one page to the next because such care is given to detail, to each child’s clothing, hairstyle, and personal items. 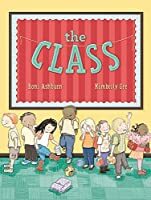 Just right for youngsters in preschool to grade three, “The Class” is a sweet book sure to soothe first-day jitters; an A+ read that offers sheer enjoyment and learning experiences too. Alarm clocks go off and students all over town wake up and get ready for their big day. Some feel eager, others are nervous, and a few are even grumpy! But they all get dressed, eat breakfast, pack backpacks, and make their way to school, where they will meet their new teacher and become a wonderful new class. Boni Ashburn's snappy rhyming text and Kimberly Gee's adorable an Count along with twenty young students from nineteen different homes as they get ready for their first day of kindergarten. Alarm clocks go off and students all over town wake up and get ready for their big day. Some feel eager, others are nervous, and a few are even grumpy! But they all get dressed, eat breakfast, pack backpacks, and make their way to school, where they will meet their new teacher and become a wonderful new class. Boni Ashburn's snappy rhyming text and Kimberly Gee's adorable and diverse group of children make this a great pick for little ones getting ready for their first day of school. Subject: Stories in rhyme -- Juvenile fiction. Boni Ashburn is the author of seven picture books, including Hush, Little Dragon and I Had A Favorite Dress. Boni lives in the Upper Peninsula Of Michigan with her four children and too many bookshelves to count. *Please note: I give 5 stars to books I adore and MUST own, 4 stars to books that will stay with me in some way and that I almost-adore, and 3 stars to books I like. Two stars might be boo Boni Ashburn is the author of seven picture books, including Hush, Little Dragon and I Had A Favorite Dress. Boni lives in the Upper Peninsula Of Michigan with her four children and too many bookshelves to count.